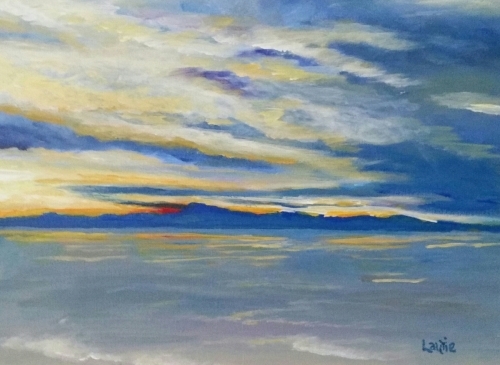 I paint impressionistic style dreamy California and Hawaiian seascapes and landscapes on canvas. I also enjoy painting wildlife, sealife, pets and stilllife. And I'm always painting the gorgeous southern states, my home. 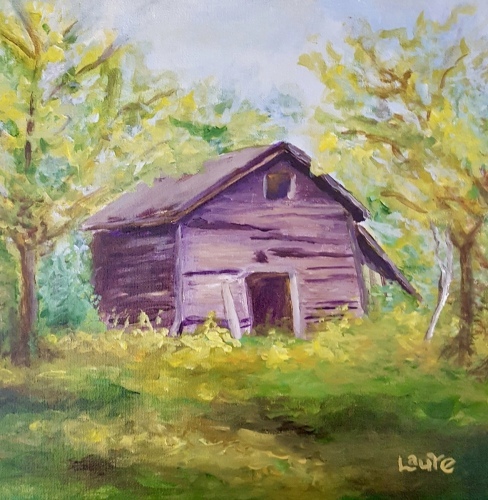 I would love to paint from your wonderful photos or you can choose a dreamy painting from my website. And don't forget to join my email list and you could win a lovely art gift in my monthly drawing at the end of the month!!! See button at top right or bottom left. I promise not to bombard you with emails and you can unsubscribe at anytime. 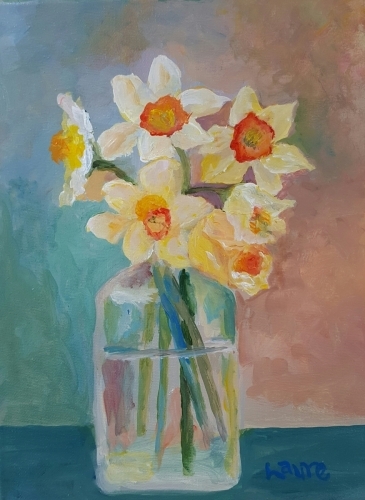 Subscribers get a lot more freebies, such as free downloads, 20% off original artwork, free giftwrap with a painted card and free consults whenever they like. A beautiful sunset on Catalina Island as seen from Laguna Beach. 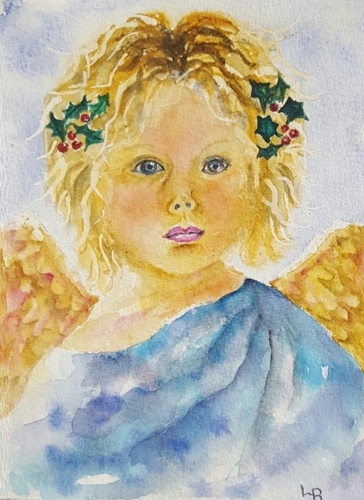 The original painting was used in a raffle fundraiser for the Hydrocephalus Association. My grandson, Gavin, was born with hydrocephalus, which is somewhat common among premature babies. The usual treatment for hydrocephalus is brain surgery; therefore research is very important. 100% of my proceeds on the sale of this print will go to HA. You can learn more about hydrocephalus at www.hydroassoc.org. Gavin is now 5 and thriving, for which we are very grateful. 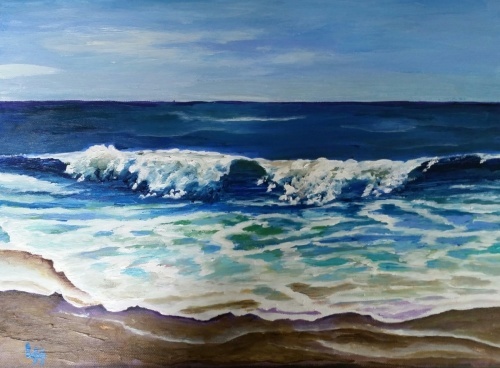 5" x 6.75"6" x 8.25"7" x 9.5"8" x 11"9" x 12.25"11.5" x 15.75"
This is painted from my son-in-law's photo of San Clemente. It was painted for a friend, Michelle, who has a very aggressive form of cancer. She's young, with 2 kids to raise. 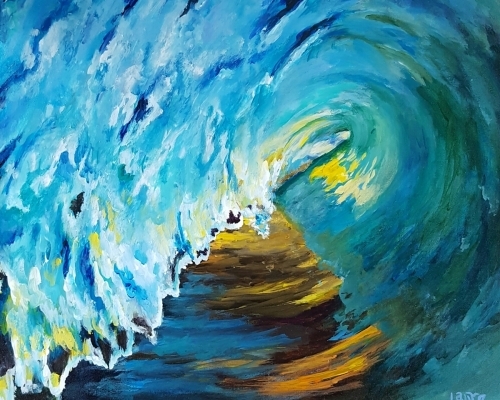 I painted with a purpose, before I knew how to paint waves, really. But the sky is dreamy, as is the writing on the back. If you're reading this - say a prayer for her or think good thoughts if you believe in those. 50% of my proceeds on the prints will go to cancer research. 5" x 6.25"6" x 7.5"7" x 9"8" x 10.25"9" x 11.5"11" x 13.75"
5" x 6.25"6" x 7.5"7" x 8.75"8" x 10"9" x 11.25"10.25" x 12.75"
I painted this from a photo I took at South Carlsbad Beach. It's a favorite local beach, that is not too crowded with beautiful waves and you can park right on the sand. I painted it for my friend and neighbor, Dawn, who suffers from chronic pain like me, but has the very best attitude. She is just lovely and her favorite color is blue, same as me. Therefore, the original is not available for sale, but the prints are quite reasonable and you can contact me via email for giclees. 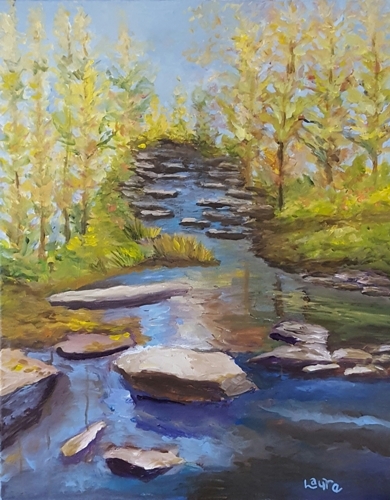 5" x 6.75"6" x 8.25"7" x 9.5"8" x 10.75"9" x 12.25"12.5" x 16.75"
I painted this from a photo my niece, Ally, took when she was hiking near Chicago. The photo had this amazing rainbow of color starting with green ground cover and trees with orange, red, brown and yellow leaves - then the beautiful blue sky. I knew I had to somehow paint this rainbow of fall colors. I gave the original painting to my Aunt Betty who has given me so much love and support all my life and encouraged me, always in all ways. So the original is not available for sale. 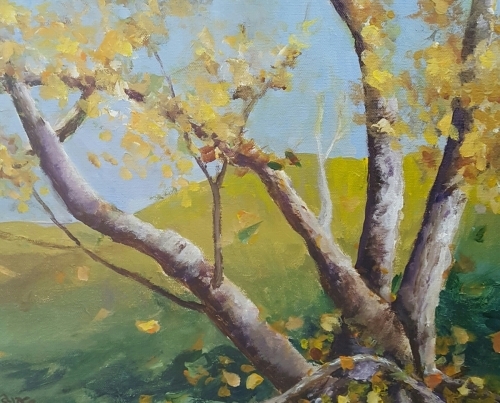 If you have a photo of a beautiful fall scene, I would love to paint it for you! [A 9" x 12" print is just $10 and a giclee is $42.] I have had giclees made of this one and they turn out lovely. 6.75" x 5"9.5" x 7"12.25" x 9"15" x 11"17.75" x 13"19.25" x 14.25"
Mississippi Shack. If you've never been to Mississippi or Alabama I recommend you go for a visit and stay in a B and B to get some real southern hospitality and home cooking. There is nothing like it anywhere else in the country. The air is clean, the countryside is beautiful and the people are warm and welcoming. My father was born and raised in Cordova, Alabama, and my favorite vacations growing up were trips to Alabama. This painting reminds me of so much that I love about the south and all my friends and family back in Alabama. I lived in Birmingham for about 20 years and it will always be home for me. Roll Tide!!!! Had to put that in there, sorry Auburn.... [13" x 13" print is $13 and the same size giclee is $44]. Giclees are found under the go to frame shop under the canvas selection. 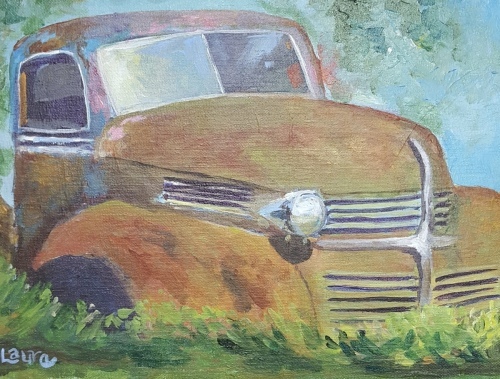 5" x 5"7.25" x 7"9.25" x 9"11.25" x 11"13.25" x 13"
Original Acrylic painting of a rusted out old Dodge truck. I had a lot of fun painting this truck. It reminded me of the old trucks my Uncle Don used to drive. He always believed in buying American made trucks and loved older models because he believed they were built to last. I thought of him while I painted this. My Uncle has passed, but I have so many wonderful memories of him and his trucks. If you would like a print of this please contact me directly [[email protected] or 760.717.2066] and I can have one made from a different website. 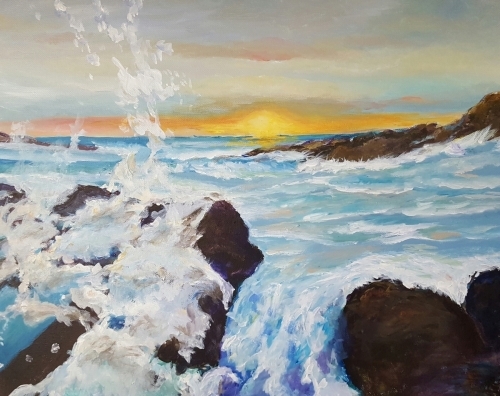 This is a a Laguna Beach Seascape painted from a photo taken by my son-in-law, Matt. 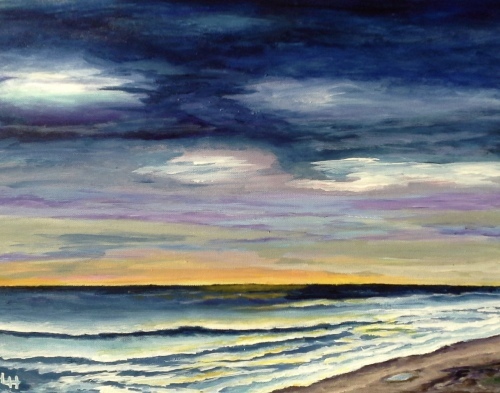 It's one of my favorites and is currently on display at a local art gallery in Encinitas, California. Laguna Beach is one of the prettiest beaches I have ever seen. The water there is so blue against the very dark rocks. The waves and white water are so clear and the sunsets are just stunning. In Southern California the only other beach that comes close to these colors is Malibu. So if you travel this way, be sure to visit beautiful Laguna Beach. And check out Matt's awesome photography at mallenphotography.com. 5" x 6.25"7" x 8.75"9" x 11.25"11" x 13.75"13" x 16.25"13.75" x 17.5"
This is the 3rd big wave I did. I painted it very fast and loose and love the way it turned out. Sometimes inspiration hits and you know, it's time to paint. My best paintings are usually those that are done very quickly without much detail work. 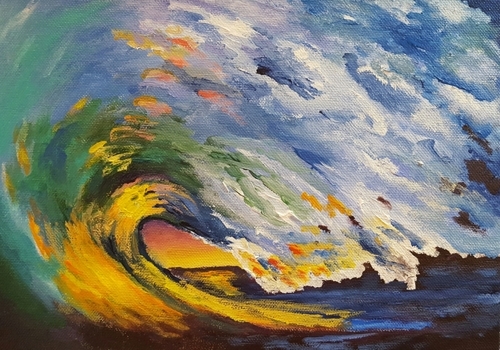 This one had a lot of texture and a limited palette and that works well for a big wave. 6" x 8.5"6" x 9"7" x 10"8" x 11.5"9" x 12.75"12" x 17"
I painted this scene from Alabama here in Southern California. And though I love living here, I still miss Alabama, its clean sweet air, lush green foliage, yes, even kudzu, syrupy sweet tea offered up everywhere, friendly southern drawls, damp humid air, fantastic southern food!!! !, fresh veggies from those meat and 3s, oh man!!! !, Milos oh man, the feel of cool water on a hot summer day, Evie's pool, Jim n Nick's BBQ, Chez LuLu, White Flower, Oak Mountain, Pea Vine Falls, but most especially my wonderful friends. Love y'all. This is my Alabama love song. From my Cordova, Alabama roots...I will always carry Alabama in my heart. 6.5" x 5"9" x 7"11.5" x 9"14" x 11"16.5" x 13"17" x 13.25"
Is it haunted? Would you sleep here? And listen to the waves, and the creaking of salt rotted wood at night? 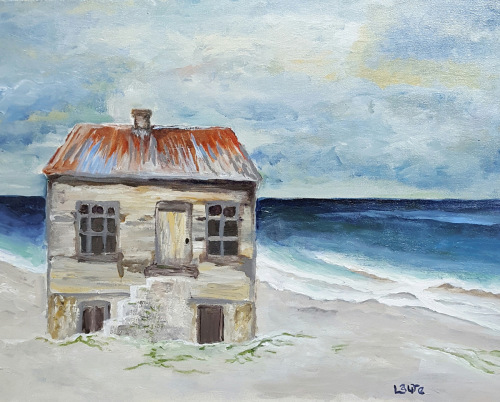 I loved painting this old house on the beach and the beautiful sky. It is my favorite sky that I have ever done. I love blue and yellow and all the swirls. I completely made up the sky in my head as it looks nothing like my reference photo. I wanted to paint a cloudy day at the beach with an old house instead of the cutesy beach cottage which is the usual thing. I really love the way this turned out. Daffodils remind me of spring in Alabama. They were often the first spring flowers that popped up in my yard. I lived in a yellow house and I love yellow flowers. When I look at this painting I am reminded of the south in spring time: azaleas, dogwoods, red buds, all providing a riot of colors after the dull winter. I used to plant my daffodils in the middle of my pansy pots on my front porch. The pansies might make it to May or so...but looked so great surrounded by the daffodils. 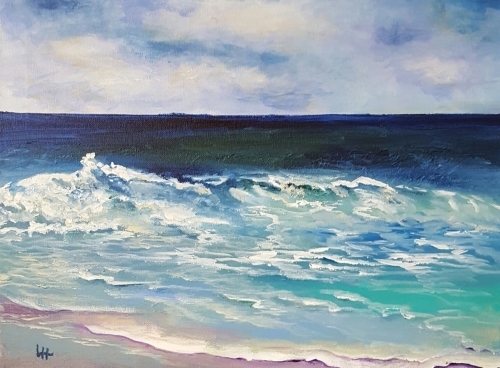 I painted this from a photo I took when we were walking on the beach near our house. It was a very cloudy night and the sky was a mix of soft pastel blues and taupes that melted into an ocean of the same colors. I wanted to capture those unique colors on canvas. Now and then the sun would peek out. At times the horizon disappeared. It was just a lovely breezy night full of soft pillowy textures and unique colors. 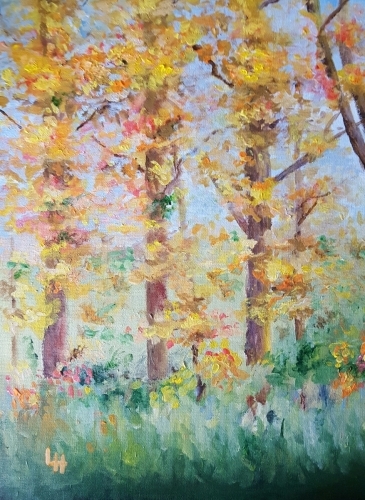 This painting is unique because of the neutral palette used and soft greens and blues. It will look lovely in living rooms, dining rooms, dens and bathrooms. If you join my email list you get a 20% discount! This is a gorgeous wave from the beach in Hawaii. It is curling down just as the sun is setting so you can just glimpse a bit of sunlight through the thinnest part of the wave, which is the very bottom part of the tip on the left. The water is all the beautiful colors of the Hawaiian ocean, from navy to turquoise to white foam. The waves are so gorgeous in the sunlight; there is nothing I'd rather do than watch those waves on Hawaii. It is much harder to capture them on canvas. 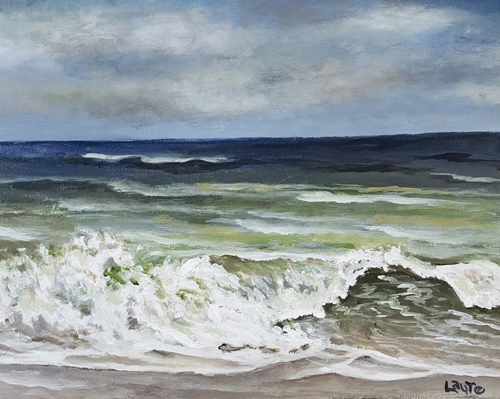 I hope you can almost hear the crash of the water when you see this painting, and smell the salty air and imagine the surfers, and the dolphins... [A 13" x 16" print is $13 and giclee is $44]. 5" x 6"7" x 8.5"9" x 11"11" x 13.5"13" x 15.75"
This still-life reminds me of folks I hold dear, my Mom, my friends and family back in Alabama and Mississippi and of a slower time in the past. A time when folks sat on the porch sipping tea and telling lies. My Mom always set a nice table on Sundays with linen napkins and tablecloths. I have been collecting Mississippi pottery for over 25 years. There is something about the mud in Mississippi...it makes the best pottery. This is Keith Stewart and McCarty pottery. And the quote on the teabag is from a recent novel, "The Help". Of course, no southern table is complete without flowers or greenery...These are just a few of my favorite things. 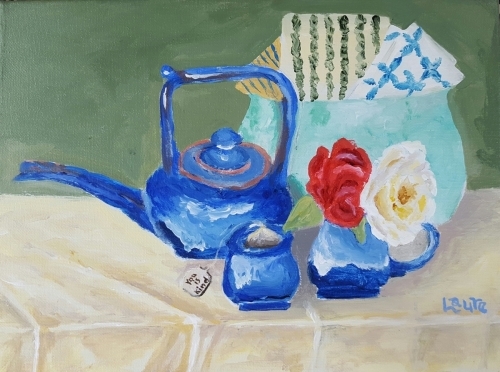 Let me paint a still life of your favorite things, just take a picture and email me. 7" x 9.5"9" x 12"11" x 14"11" x 14.75"13" x 17.5"14.25" x 19"
I painted this wild dogwood from a photo I took at my friend, Sandra's in Alabama on my last trip home. It reminded me a lot of my back deck on my house in Alabaster, Alabama, where I lived for about 20 years. There was just woods in my back yard with lots of pine and hardwood trees and of course wild dogwoods. The blooming of the dogwoods was always the first sign of spring in my backyard and brightened up the very dense woods. I have always loved spring in Alabama, the azaleas and daffodils and redbuds blooming everywhere. It is something to see. There are pink dogwoods, but I always preferred the wild and unruly white ones...and then the legend of the dogwood tugged at my heart. This was painted for my lovely Aunt Betty who lost her son, Michael, in December, 2017. He was just 48 and even though he was younger than me he was someone I leaned on so much. But he was someone many could confide in and did. He touched and changed so many lives. He will never be forgotten. I love you Mike. The original seen here is not available, but prints are. 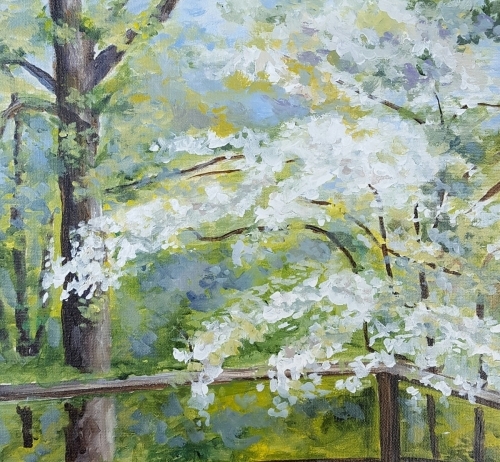 I could do another similar dogwood painting upon request. [12 x13 print is $13 and a giclee is $36.00]. 5" x 5.5"6" x 6.5"7" x 7.5"8" x 8.75"9" x 9.75"11.75" x 12.75"
California Flowers $125.00. I painted this in March, 2018. It reminds me of all that I love about California. The beautiful flowers, palms, the beaches and of course, the lovely climate. Sometimes I can't believe I live here... 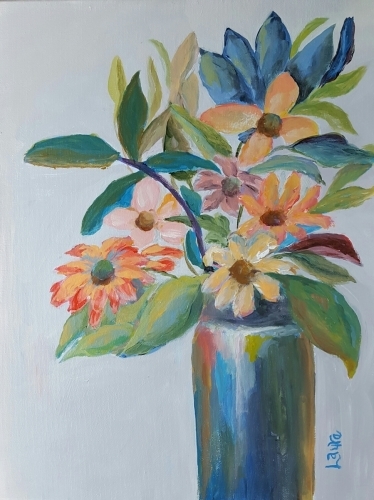 If you have a photo of flowers you want to remember forever, I would love to paint them for you, so you will have a pretty reminder hanging on your wall of a very special time. 6.75" x 5"8" x 6"9.25" x 7"10.75" x 8"12" x 9"16.5" x 12.5"
Is anything prettier than a field of daisies? This painting would be like waking up to spring every morning and putting a little smile on your face. 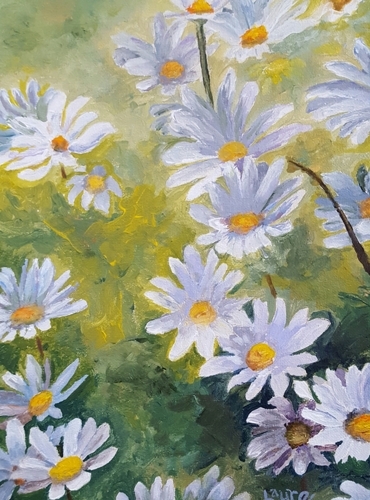 Daisies are one of my favorite flowers and when I saw a photo of daisies in a field I just had to paint them. The shadows on the petals were a lovely blue gray color that I mixed so many times. This will always be one of my favorite paintings. You can buy this painting as a 9" x 12" print for just $10 or a 9" x 12" giclee for $35. The giclee is listed under the go to frameshop options as "canvas". Please contact me if you have any questions about a purchase. 6.75" x 5"9.5" x 7"12.25" x 9"14.75" x 11"17.25" x 12.75"
I painted this watercolor as a Christmas card to my new boyfriend, now husband. And he kept it, ...and me. 6.75" x 5"8.25" x 6"9.5" x 7"11" x 8"12.25" x 9"15.75" x 11.5"